Click here to arrange finance on this item. Any information you enter on our site is fully protected and encrypted by the highest level of SSL certificate. ieDepot has been fully verified as a trustworthy organisation by GeoTrust as evidence by the green address bar at the top left of your screen. We have secured every page on the website to ensure your browsing and buying security. You will enter your payment information on either WorldPay's or PayPal's secure payment portals. These are the two largest payment processors in the world with unrivaled reputations. We offer free next business day nationwide delivery for all orders over €79 regardless or size or weight. 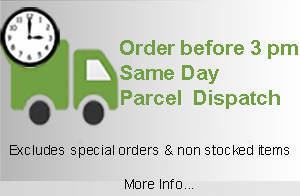 We use Fastway and Nightline couriers both of who have an impressive next day delivery record of 95%. The vast majority of orders received on a business day before 3 pm will be dispatched same day for delivery the next business day. You may return most new unused products (special orders are not returnable) that are in resalable condition items within 10 days of delivery for a full refund. Please make sure the products are packaged correctly. We'll also pay the return shipping costs if the return is a result of our error (you received an incorrect or defective item, etc.). You must inform us within 2 days of delivery if the item is damaged or defective. Please note that means for gifts or items that you are not going to open for a while that should open and inspect your purchases upon receipt. You should expect to receive your refund within 5-8 days of giving your package to the return shipper, however, in most cases you will receive a refund much more quickly. This time period includes the transit time for us to receive your return from the shipper, the time it takes us to process your return once we receive it, and the time it takes your bank to process our refund request. Our loan agent will contact you to process your purchase. This 3 hp cast iron table saw from Holzstar comes complete with a sliding table and rip fence for maximum versatility. It is manufactured from painted and galvanized steel for protection against corrosion and top table and sliding table are cast iron. There are side and rear table extensions for added material support. The saw blade can be tilted from 90 ° through to 45 ° to the left and can be set at any angle in between via an easily adjustable handwheel, and is fitted with a saw blade guard. It is fitted with a large central suction connection of Ø 100 mm and Ø 30mm suction hose to the saw guard. Height adjustment of the saw blade is also easily adjusted via handwheel and is infinitely adjustable between 0 and 80mm. Stable and rigid suspension of the saw unit at the front and rear allows precise cuts. This saw has a powerful motor equipped with thermal overload protection. This saw is suitable for the serious home workshop and and for the entry level or smaller professional joinery shops. 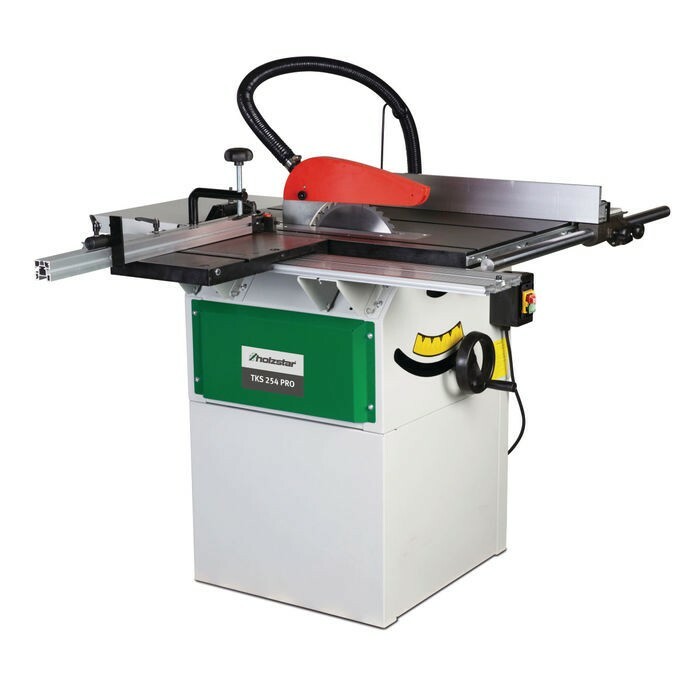 Typically this saw would be best suited to bespoke furniture making or cabinet makers. It can be used for kitchen doors, frames and cabinets but is not suitable for production kitchen work. 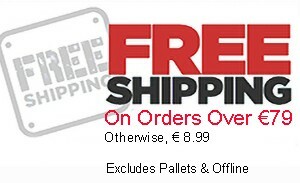 Pallet delivery charge applies: Typically 3 - 5 day delivery, this item is dispatched directly from the manufacturer and cannot be collected from our depot in Loughrea.